30 September 2015, at 12:00a.m. GERMANY - Germany is aiming to be in the vanguard in setting new standards for animal welfare across Europe. This month marks the first anniversary of the agriculture ministry’s initiative to boost animal welfare policies and promote good practice within the livestock sector and to the public at large. The initiative, “A Question of Attitude – New Ways for Better Animal Welfare”, has seen some major changes in animal welfare practices over the last year through voluntary action backed by the agriculture ministry. In the poultry sector, moves have been introduced to end beak trimming and developments have also been introduced through research for the early sexing of chicks in the egg to end the practice of killing male chicks in the production of laying hens. The welfare initiative has seen the launch of the centre for the protection of laboratory animals and also this month will see the presentation of the Animal Welfare Prize. To mark the anniversary of the animal welfare initiative, the German Minister of Agriculture, Christian Schmidt, launched a new portal on the website to create a forum for animal welfare issues. In launching the new portal, Minister Schmidt said that it demonstrated the progress that has been made in tackling welfare issues and highlights the key challenges, showing consumers that the livestock and animal sectors are actively pushing for improved animal welfare. “Germany will be a trendsetter in animal welfare,” said Minister Schmidt. He said that pet and animal owners and society as a whole has a duty to actively promote animal welfare and continually improve it. He added that the portal will be a central platform to answer questions about livestock and government policy initiatives. The website allows consumers to check what the German Ministry of Agriculture, BmEL, is doing to promote animal welfare in Germany as well as explaining current initiatives, new methods and research to know for more animal welfare and find out more about animal husbandry in Germany. It said it will allow consumers to find out for themselves about the welfare of the animals that go to produce the meat they buy and show them what to look for on the meat labels in the shops. The ministry said that animal welfare is not just an issue for the farmers, the meat industry and trade it is also "a question of attitude" of consumers. The website will report on a key issue every month and pass on consumer tips. It will provide “Shopping Help" to allow consumers to learn about the animal welfare label through the trade and industry initiative. It says it will aim to expand consumer knowledge on animal husbandry allowing them to learn how cattle, pigs and poultry are kept and attention is paid to what during transport and at slaughter. As part of the initiative to expand consumer knowledge on livestock husbandry and practices, the website spells out the welfare policies for livestock on the farm, in transport and in the slaughterhouse. For the transport of poultry, it shows that the birds are moved gently onto a conveyor to move them into transport boxes and the sector not only adheres to the EU regulations on the protection of animals during transport but is also governed by the German Animal Protection in Transport rules. These include tighter rules over the time allowed in transit and sets out rest periods, temperature, ventilation and humidity levels in the truck as well and ensuring those working in moving and slaughtering the birds have official certificates. The initiative also spells out the need for veterinary inspection before the animals are transported as well as the need for tight veterinary inspection within the slaughterhouse. The initiative has similar guidelines for pigs and cattle demonstrating to consumers the amount of space required for rearing pigs, the transport and slaughter guidelines for pigs and cattle and the actions that have to be taken to reduce the stress experienced by the animals. 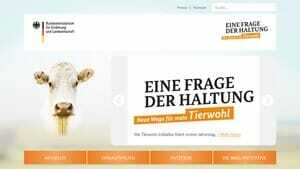 The new animal welfare website (in German) can be found on http://www.tierwohl-staerken.de/.